Can the human resources software provider continue to meet sky-high expectations? Paycom Software (NYSE:PAYC), which targets small and medium-sized businesses with its workforce management and payroll software, has been on a roll recently. After the early February reporting of impressive 2016 revenue growth of 46.5% and net income growth of 117.5%, the stock is trading at all-time highs. With Paycom scheduled to report first-quarter earnings on May 2, here are a handful of important items for investors to look for. Paycom achieved its extraordinary rates of growth last year partly from a revenue boost tied to the Affordable Care Act, as a wave of clients signed up for Paycom's solutions to ensure compliance. That means comparisons to last year are going to be rough. For context, in the first quarter of 2016, the company managed top-line growth of 63%. So don't be surprised to see that sizzling revenue growth decelerate quite a bit. To give you some idea of what Paycom believes is sustainable, the company's long-term target is for 30% annual revenue growth. The company provided first-quarter guidance for revenue of $114.5 million to $116.5 million, reflecting around 28% annual growth at the midpoint. 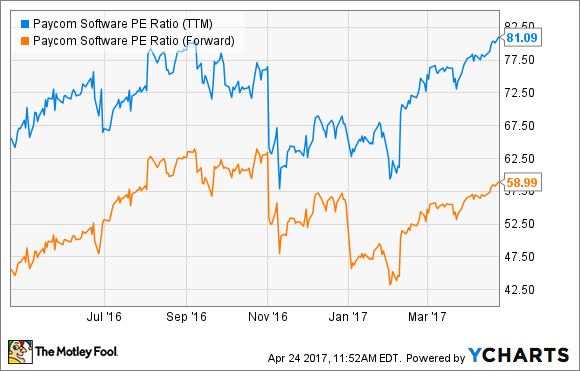 Sitting just above the midpoint, the average analyst estimate is for $115.8 million in revenue. What to look for: Whether the company meets its guidance. In addition, if revenue falls short of analyst estimates, be prepared for the share price to get whacked. Paycom sells its software primarily to clients with between 50 and 2,000 employees, with this niche somewhat underserved by larger players in the payroll space. However, Paycom's licensing agreements generally include a per-employee fee, which provides plenty of incentive for the company to keep making inroads with larger companies. In fact, Paycom says its "annualized opportunity per employee" is $400 or more. Over the past couple of years, Paycom CEO Chad Richison has discussed a handful of these larger client wins -- in the 2,000- to 8,000-employee range -- on each earnings call. What to look for: Whether the company's efforts with bigger companies continue to gain traction. If so, this should provide an additional boost to future revenue. Paycom's customers tend to be very loyal. The company claims its retention rate of 91% -- which has held firm for five straight years -- is the best in the industry. This loyalty means that once a customer is signed, it tends to generate stable revenue year after year for Paycom. Investors should be quite pleased that for 2016, recurring revenue grew 47.1% and made up 98.3% of Paycom's total revenue. What to look for: Recurring revenue as a percentage of total revenue. This is largely a formality, as nearly all of Paycom's revenue is recurring -- between 98% and 99% for the past four quarters. But if somehow this number were to fall significantly, it could mean Paycom's future revenue was becoming less predictable. Paycom uses an adjusted EBITDA margin (that's earnings before interest, taxes, depreciation, and amortization) as a key profitability indicator. As the company has scaled up, its adjusted EBITDA margin has almost doubled over the past five years, from 16.7% in 2012 to nearly 29% in 2016. Eventually, management believes it can boost this measure even further, with a long-term target of 30% to 33%. However, the company is prioritizing growing its top line in 2017 by making significant investments in its sales force, marketing, and research and development. So don't expect margins to stay at the record levels the company achieved last year. 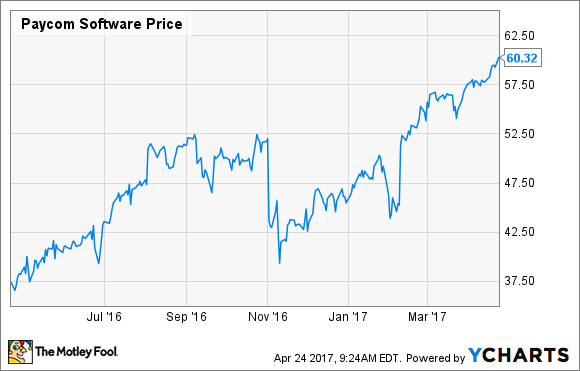 What to look for: Whether the company appears on track to meet its full-year 2017 guidance for adjusted EBITDA margin of 27%. Since its fourth-quarter earnings report in February, Paycom's share price has run-up more than 30%. On a trailing-12-month basis, its price-to-earnings ratio is north of 80. And even on a forward basis looking at earnings estimates, the P/E is nearly 60. At a nosebleed valuation like this, investors are expecting a lot from Paycom. If the company falls short of its own guidance or analyst estimates, its share price could get hit hard. For long-term investors, however, any pullback could be a great opportunity to get in on a compelling business with years of dramatic growth still ahead.